The Galactic Empire has the numbers to simply roll over opposition, crushing dissent under the boots of its platoons of Stormtroopers. These troops are perfect for engaging Rebel armies in open battle, striking fear into the hearts of those who would oppose the Empire. But on planets with dense forests or tightly-packed urban sprawls, the numerical advantage provided by Stormtroopers becomes much less pronounced. To gain a foothold on these worlds, the Empire needs troops who can adapt to the evolving situation on the ground and remain effective in any situation. 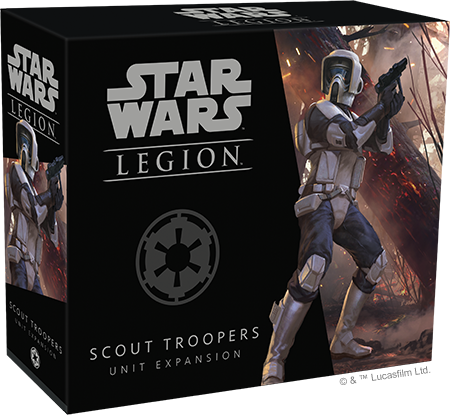 Soon, you’ll be able to give your Imperial armies this much-needed flexibility with the Scout Troopers Unit Expansion for Star Wars™: Legion. 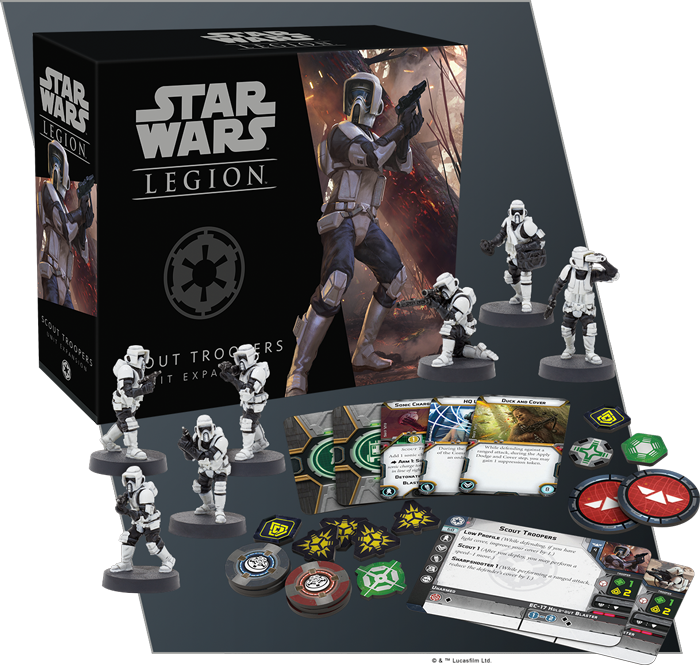 Inside the Scout Troopers Unit Expansion, you’ll find everything you need to add Scout Troopers to your Imperial army, including seven easily assembled, unpainted Scout Trooper miniatures and five upgrade cards. Employing a variety of special issue weapons, these special forces troops bring a new level of deadliness to your Imperial forces, and today, we’ll take a closer look at the many ways you can take advantage of their skills on the field! Stormtroopers are a common sight throughout the galaxy, maintaining order on countless Imperial-occupied worlds. There are few, however, who have caught a glimpse of a squad of Scout Troopers and survived. These elite troopers often work in the shadows, operating best when the enemy doesn’t even know they’re present. 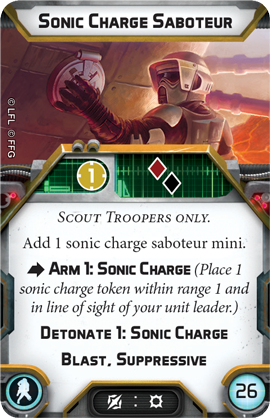 Unlike standard rank-and-file corps units, Scout Troopers are a special forces unit, so you can include up to three Scout Trooper units in your army if you want to take full advantage of the tactical flexibility they provide. Trained in advanced reconnaissance, the Empire often relies on Scout Troopers to identify key points on the battlefield and remove any obstacles from the path of other Imperial forces. To accomplish this goal, Scout Troopers feature some powerful abilities not seen in other Imperial trooper units. For example, their advanced training has made every Scout Trooper more proficient with a blaster than other Imperial troops. Every Scout Trooper has the Sharpshooter 1 ability, reducing the defender’s cover while the Scout Troopers perform a ranged attack. As a special forces unit, Scout Troopers are also expected to be highly mobile and, with their Scout 1 ability, they are on the move as soon as their boots hit the ground. 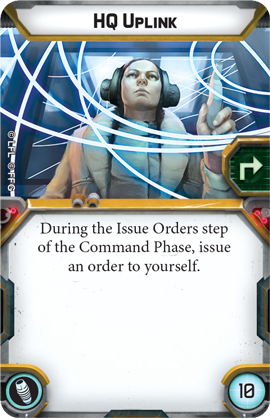 This ability allows them to make a speed-1 move immediately after they’re deployed, helping them begin their infiltration and sabotage operations in cover. This added burst of mobility does come at a cost, however. To remain on the move, Scout Troopers wear lighter armor than Stormtroopers and, as a result, are one of the few Imperial units to roll the weaker white defense dice. 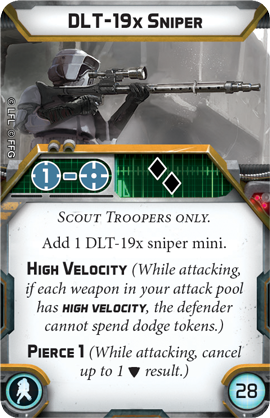 Luckily, Scout Troopers are also capable of maintaining a Low Profile, further improving their defense while in light cover. While these traits certainly set them apart from other Imperial infantry units, Scout Troopers truly distinguish themselves with the ability to deploy in two distinct ways. 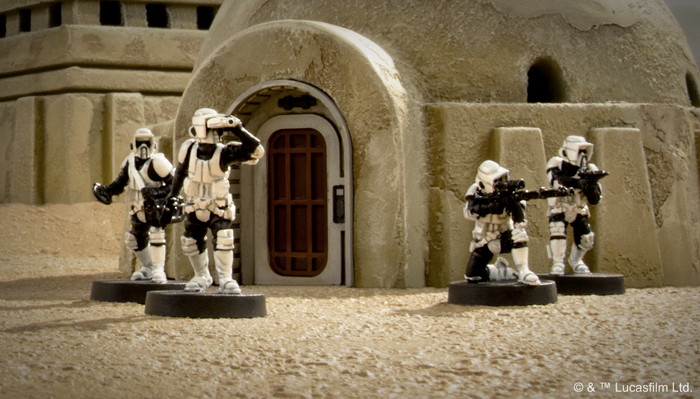 For 60 points, you can field a standard unit of Scout Troopers, using the two black dice from each miniature’s EC-17 Hold-out Blaster to launch a strong attack from mid-range. But Scout Troopers can pose a threat up close or from across the battlefield by adding one of two heavy weapons miniatures to your squad! These heavy weapons miniatures can be added to a regular unit, but they might be even more effective when you create a two-miniature strike team focusing on a single heavy weapon. Beginning at only sixteen points, a strike team can help you shave points off the cost of your army while still taking advantage of the firepower provided by these heavy weapons. Adding a DLT-19x Sniper, for example, creates a sniper team capable of picking off targets from long range. 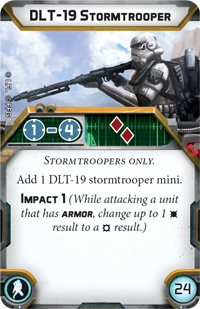 This blaster rifle might not have the same raw power as the model carried by some Stormtrooper units, but it more than makes up for it with the chance to fire at nearly any target on the board and pierce through enemy defenses. The DLT-19x Sniper takes a shot at Han Solo from beyond Range 4! 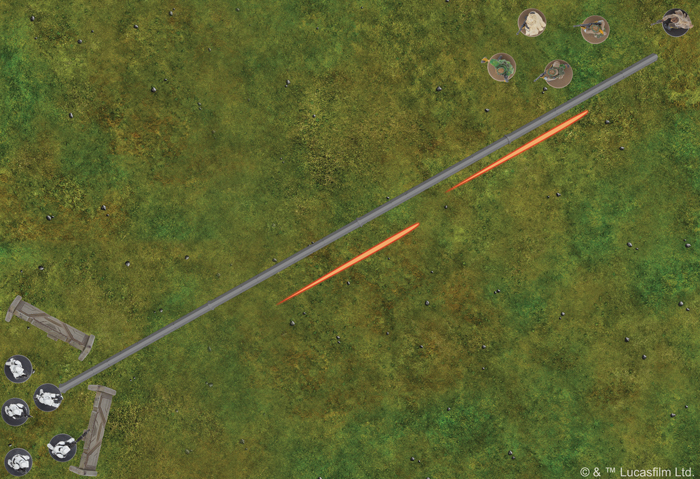 If you want to operate a bit closer to the enemy, you could always add a Sonic Charge Saboteur to your unit. This heavy weapons miniature can perform an action to plant sonic charges across the battlefield. Then, after any unit performs an action, that charge can be detonated, dealing damage to any unit caught in the blast radius. Sonic charges can stop a unit in its tracks, doling out extra suppression that could send it scurrying in the opposite direction. With only two miniatures in this smaller unit, you’ll want to do everything you can to keep your strike teams out of harm’s way. Thankfully, you can equip them with some upgrades that should help. 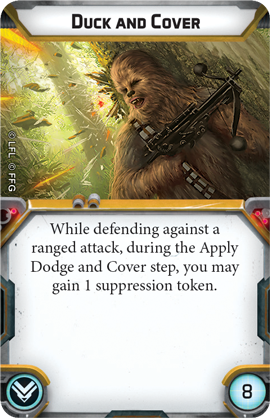 With a little training, your Scout Troopers can learn to Duck and Cover, bolstering their innate ability to take advantage of cover. 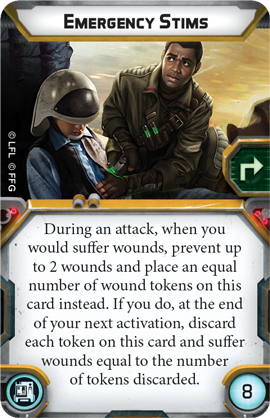 But if they do end up taking some wounds, you can always equip them with some Emergency Stims, buying enough time to squeeze off one final shot. Finally, as a special forces unit, Scout Troopers need to quickly adapt to be most effective. Equipping them with an HQ Uplink can ensure they’re ready to move and attack at the perfect moment. The Rebel Alliance doesn’t often follow the conventional rules of warfare. When overwhelming numbers simply aren’t enough to beat them back, Scout Troopers will be there to secure Imperial dominance. 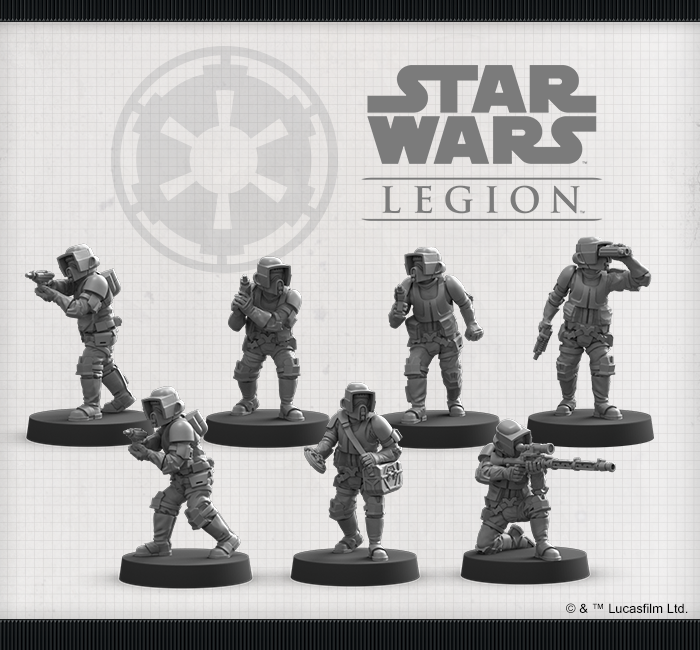 Look for the Scout Troopers Unit Expansion (SWL19) to release alongside the Boba Fett Operative Expansion (SWL18) late in the third quarter of 2018! Pre-order your copy at your local retailer or online through our website today!